Do you want the secret to developing a defined, enviable chest? It's the underrated, but extremely essential, pectoralis minor muscle. This muscle is thin and flat; it lies underneath the larger pectoralis major, which consequently gets all the fanfare. Swimmers have defined pecs largely because the simple front crawl stroke develops the pec minor. Bodybuilders and gym rats hammer their pec major in hopes of building a bigger chest, and this is a good technique. However, these gym goers miss something when they leave the pec minor out of the training equation. What is the Pec Minor? The pec minor is triangular in shape and responsible for movement of your scapula. It helps keep your shoulders from shrugging up toward your ears and rotates your shoulder inward. The pec minor attaches the ribs to the shoulder blade. It's about equal in size to your biceps muscles, meaning that when you build up the pec minor, it can contribute some serious volume to your chest muscles. It's considerably smaller than the pec major, but that doesn't mean it's less important. When you hit the gym to train your chest, you likely head straight to the bench press rack. While the bench press is key in developing the pec major, you'll need to add a few other moves to develop the pec minor. It's impossible to isolate the pec minor, per se, but certain chest strengthening exercises target it more specifically than a flat bench press. Dips build both your pec major and pec minor. The key is to direct your bodyweight forward as you press up and down. 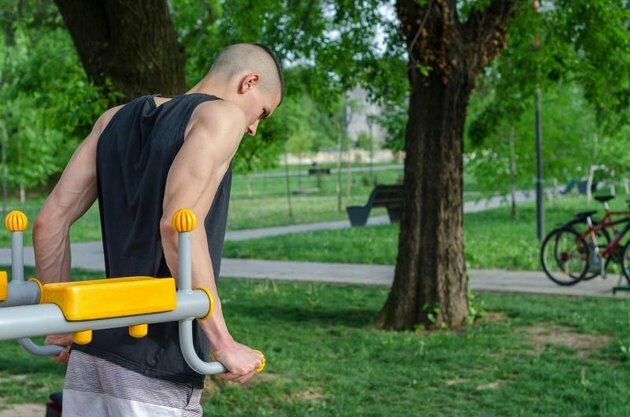 Put one hand on each of a set of parallel bars. Hover your legs by kicking your heels behind you. Elevate your body by keeping your arms straight. Bend your elbows as you lean forward slightly and lower your body. Stop when you feel a stretch in your chest. Extend the elbows to complete one repetition. When you're able to master your body weight with the dip, add extra resistance by hugging a dumbbell between your lower legs or strapping a weight plate around your waist with a chain. The fly isolates the pec major, but requires significant assistance from the pec minor. Stand in the center of a cable cross machine with the pulleys set at the highest level. Grasp a pulley handle in each hand. Keep the pulley handles to your sides and bend your elbows slightly; point your elbows to the back and sides. Hinge forward a little from the hips and knees. Draw the cable handles toward each other to meet in the center of your chest. Open the arms back up to the starting position to complete one rep.
Keeping the pec minor flexible is crucial in its health and development. 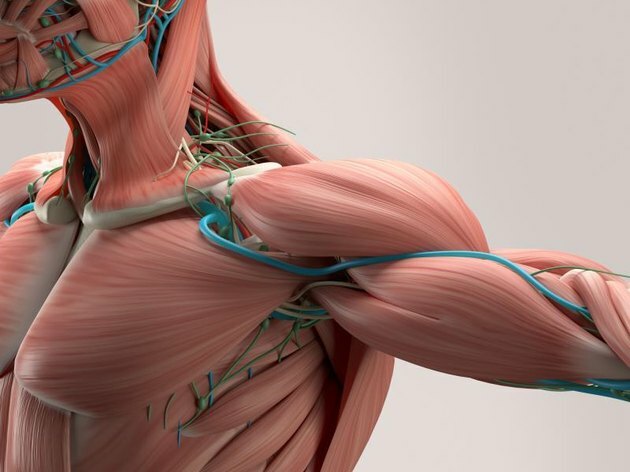 A flexible pec minor muscle may also protect you from shoulder problems, such as impingement, suggests a study published in a 2006 issue of the Journal of Elbow and Shoulder Surgery. Gross Stretch: Lie on a table on your back. Allow one arm to hang off the side with your shoulder positioned at the edge. Bend the elbow to 90 degrees so that the hand is facing the direction of your head. Have a partner gently press on the forearm of the hanging arm until you feel slight pressure at the front of the chest and shoulder. Hold for 30 seconds, and then repeat on the other side. Doorway Stretch: Stand inside a doorway and place your your arm inside the frame with the elbow and shoulder bent to 90 degrees — like half of a goal post. Lean into the doorway and rotate your free side away to increase the sensation in the chest. Hold 20 to 30 seconds, and then repeat on the other side.